I offer a range of topics based on my interests, research and experience that can be blended and adapted for an institution and presented as a keynote presentation, interactive seminar or facilitated workshop. I have extensive experience of designing and facilitating interactive workshops in the UK and overseas and have contributed to university CPD programmes for HE teachers in the UK, Ireland, America, China and Saudi Arabia. A distinctive feature of my approach is to work with participants before and after an event to develop knowledge and understanding through on-line questionnaires and post-event discussions using Google+ forums. This approach maximises the opportunity for learning and makes sure that contributions are relevant to participants and institutions. My recent work involves exploring the idea of learning ecologies and trying to understand the implications of the idea for students' learning and higher education teaching and learning practices . I am currently exploring the idea of personal pedagogy. I offer a range of research-based interactive presentations and workshops to introduce the idea to academic staff and to encourage them to evaluate and apply the ideas to their own teaching and learning situations. I have developed activities that encourage HE teachers to develop a deeper understanding of their personal pedagogy. I have been interested and involved in researching creativity in higher education for 17 years. I have written many articles and given many keynote presentations. I offer a range of research-based presentations and interactive workshops on the nature of creativity in higher education, disciplinary perspectives and pedagogical practices that encourage and facilitate students' creativity. My interest in the idea of lifewide learning and education began in 2008, when I was Diirector of the Surrey Centre for Excellence in Professional Training and Education, at the University of Surrey. 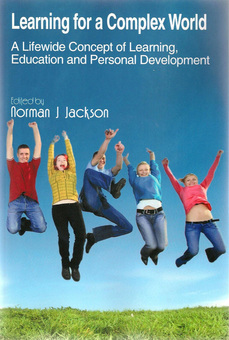 We developed and piloted the Surrey Lifewide Learning Award and the results were published in a book (Jackson 2011). In 2011 I formed a new organisation the Lifewide Education Community to promote, develop and apply the ideas developed by SCEPTrE. I offer presentations and workshops on the idea and practice of lifewide learning which also form the basis for my current research and development work on learning ecologies. I offer consultancy on how a university might encourage and recognise students' lifewide learning and achievements. Between 2011-13 I was commissioned by Southampton Solent University to undertake an interview based study of how the university had changed through a three year programme of strategic change funded by HEFCE. It was a great privilege to talk to the many teachers who had been inspired to innovate through the programme. The research was published in a book which I co-wrote with two members of the university. The case study, together with my own experience of trying to bring about educational change at the University of Surrey and my brokerage for agencies like the Quality Assurance Agency and Higher Education Academy, informs my presentations and workshops on changing higher education.